Fresh off a week’s rest for the all-star game, the Washington Mystics improved their home record to 6-3 with an 87-74 win over Seattle in a Wednesday matinee at Verizon Center. Washington’s Ivory Latta dribbles past New York’s Anna Cruz. Image courtesy of Monumental Network. “We’re desperate, we need it, it’s our win tonight. No matter what it takes, we gotta do it.” That’s how Washington Mystics center Kia Vaughn described the team’s mindset heading into Friday night’s game against the New York Liberty. After a lackluster showing against the Seattle Storm May 24, the Mystics needed to seize their home court advantage to set their season back on track. A strong first half and a dominating 4th quarter rush (led by 5′ 6″ guard Ivory Latta) propelled the Mystics to their first home win of the season, a 68-60 victory over the New York Liberty. Latta led the team with 15 points, 12 of which came in the second half. Vaughn called her a “gut check” player for the team tonight – a player that everyone can trust to step up and make big plays when its needed. “That’s the type of player we need on the team,” she said. Rebounds were a significant area of improvement for the Mystics Friday night, and crucial to their victory, nearly doubling up on the Liberty on the boards, 41-26. That was the difference for the Mystics, and allowed them to sneak past the Liberty after an ugly 3rd quarter, where they were outscored 18-12, and into the win column. “The post players were totally relentless on the boards,” said Latta, who contributed 4 rebounds, 3 assists, and 15 points (she shot 6-for-9 from the field) in the win. Coach Mike Thibault vowed last week to remedy the team’s rebounding woes. Friday night, he told reporters that the significant improvement in rebounding was the result of some tough practices that week. Six-foot-three guard Tianna Hawkins led the team with 9 rebounds, guard Tierra Ruffin-Pratt finished with a team high 4 assists, and forward Jelena Milvanovic and center Kia Vaughn each contributed 14 points. Milovanovic made her debut as a starter for the first time this season. Forward Emma Meesseman finished the night with 9 points. WASHINGTON, D.C. – Washington Mystics guard Ivory Latta received Eastern Conference player of the week honors for the third time this season for her performance against the Indiana Fever, Connecticut Sun and New York Liberty. 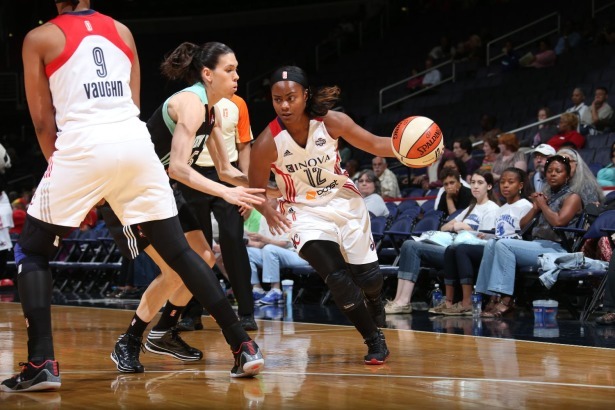 In the Mystics’ 69-67 win over the Fever, Latta scored 15 points and dished out four assists. The victory helped Washington secure a playoff berth. She followed with a 19-point, five-assist outing against the Sun and closed out the regular season against the Liberty by scoring 12 points and recording two assists. The Mystics (17-17) will open the 2013 postseason against the Atlanta Dream (17-17) on Thursday, Sept. 19, in Atlanta at 8:00 p.m. in a game that will be broadcast on ESPN2. The Mystics will host the Dream on Saturday, Sept. 21, at Verizon Center. Tipoff is at 7:00 pm. Tickets for the Washington Mystics First Round playoff games start at $12 and are currently on sale on www.ticketmaster.com or by calling 1-877-DC-HOOP-1.